From the historic travesty Elizabeth and Elizabeth: The Golden Age where dramatic license runs wild and real history comes to die. I mean you’d be better learning real history from a Renaissance Fair than in this historic disasterpiece. Yet, like Braveheart, this got Oscar nominations nevertheless. Also, there’s no way in hell Elizabeth looked like that in her fifties. Of course, my last post didn’t cover the whole Tudor age since Hollywood makes a lot of movies in this era since the Tudors produced both Henry VIII and Queen Elizabeth I. However, between their, Henry VIII’s other children Edward VI and Mary I also ruled England for those eleven years which were eventful but short. Nevertheless, Elizabeth I ascended the throne 1558 and would rule for over forty years which would signal the English Renaissance in its full flower. England soon became interested in settling colonies in the Americas with Roanoke (which failed), Shakespeare wrote his plays, the Church of England as we know it began to take shape, Mary, Queen of Scots lost her head, and the English defeated the Spanish Armada. 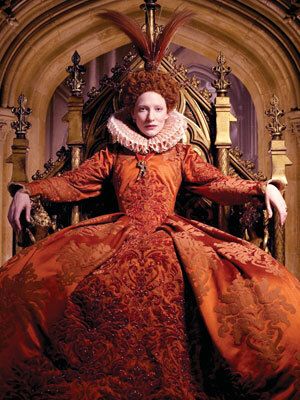 Elizabeth I was an astute monarch who helped bring England onto the world stage and led a true golden age. However, she never married and died childless which meant that her throne went to the King of Scotland at the time named James VI (I’ll get to this somehow). Nevertheless, this post will be long since one Indian director made a couple of films called Elizabeth and Elizabeth: the Golden Age that offend me both as a Catholic, a film lover, and history buff, which I should list accordingly. Apparently these were very popular in Great Britain but do make me worried since I believe filmmakers should have at least some concern with facts like people’s life dates for instance. Shekhar Kapur apparently seems to take as much of a dramatic license as Mel Gibson. Still, here are some of the movie inaccuracies from the Elizabethan Age. This entry was posted in Movies and tagged England, Europe, history, Humor, Renaissance History, Tudor Dynasty, WTF?. Bookmark the permalink.